Eric Poeshcla, MD, chief of Immunology at the University of Colorado School of Medicine, in his lab on Friday, April 28, 2017. Perhaps you don’t usually get too fired up about basic research – much less basic research in the extraordinarily difficult-to-grasp field of immunology. But consider for a moment what Eric Poeschla, MD, and his team at the University of Colorado School of Medicine have been working on. 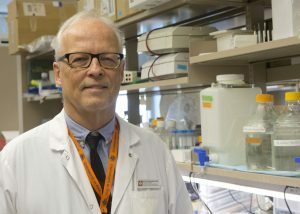 Poeschla, who sees patients at UCHealth University of Colorado Hospital, is chief of Infectious Diseases at the CU School of Medicine, where he holds the Tim Gill Chair in HIV Research. He has been battling, scientifically speaking, HIV/AIDS and other viral infections since his medical residency at the University of California, San Francisco in the 1980s. At the time, that city was at the epicenter of both the crisis surrounding the then-untreatable disease and the medical research that ultimately led to today’s HIV/AIDS therapies. While HIV/AIDS remains incurable, it’s now “by and large as easy to treat as diabetes,” as Poeschla put it. The basic research of Poeschla and his team involves mice and petri dishes of human cells in which HIV and many other viruses seem to stand no chance. They’ve managed to show that plugging a single gene from a relative of poliovirus into the DNA of the mice or of cultured human cells revs up the natural immune response to the point that both are impervious to about any virus one tries to infect them with. Perhaps the strangest thing, Poeschla said, is that the mice, rather than suffering the ravages of autoimmune disease that typically manifest when one permanently stokes the immune systems of mice or man, are no worse for wear. The potential implications are profound: our immune systems may be tweakable such that an enormous swath of viral infections – both current scourges (HIV, the common cold, flu, dengue, West Nile, Ebola, Chikungunya, SARS, hepatitis, measles, rabies and many more) and ones yet to mutate – gain no traction. It could also help clear up the roots of the sort of autoimmune attacks that lead to lupus, type 1 diabetes, asthma, rheumatoid arthritis, multiple sclerosis and so on. The National Institute on Drug Abuse, recognizing the promise of Poeschla’s efforts, announced on April 5 that he was among three U.S. scientists to receive a 2017 Avant-Garde Award for HIV/AIDS Research. The five-year, $3.9 million grant will help Poeschla hire two more postdoctoral researchers and a research technician in addition to ramping up the work his existing team of four are doing, he said. Poeschla stresses that this is basic, basic research, and that it’s too early to say whether a therapeutic of the sort he prescribes to patients in his UCH clinic might eventually emerge from this work. He goes so far as to say that a therapeutic isn’t even the point at this stage. Rather, it’s about laying the groundwork of understanding that may one day lead to one. He and his team have done a lot of work already – about four years’ worth, much of it summed up a paper Poeschla and colleagues published in late 2015. Their efforts have yielded what looks like a broad-spectrum, intracellular inoculation against viral replication that taps into the some of the immune system’s most ancient mechanisms. The immune system, mind-bendingly complex as it is, operates on two basic levels. We’re most familiar with the acquired immune system, which is the one that gets better with age (until, at least, old age, but that’s another matter), continually updating its memory with each battle with microbial or viral invaders. The acquired immune system learns as it goes, and it’s why immunization works: expose the body to deactivated versions of viruses that could cause problems and the acquired immune system is primed to attack quickly when the real thing shows up. The issue with vaccines and therapeutics harnessing the acquired immune system is that they’re specific to a given virus or narrow family of them. When something different shows up – Zika, say – scientists scramble to figure out a way to develop and promulgate a new vaccine, cure, or suppressor. In contrast, Poeschla’s research focuses on the innate immune system. It’s preprogrammed to spot chemicals fundamental to the dark activities of viruses, triggering a cascade of interferons, which “interfere” with viral replication and also act to trigger various other pathogen-fighting responses in the cell and neighboring cells. Viruses have come up with a cunning way to reproduce inside of host cells: they nab material from membranes from the structures inside cells to build bubbles called “replication factories” in which they quietly multiply. Scientists have long believed the main goal of this clever coopting was to concentrate the chemicals involved in viral replication and make the process more efficient. Poeschla and colleagues have another explanation. Poeschla’s group focuses on one of those replication-factory chemicals. It’s called RNA-dependent RNA polymerase, or RdRP. It’s vital to RNA viruses, which most viruses are. Usually, the RdRP does its business of helping make double-stranded viral RNA while sequestered inside a replication-factory bubble. Poeschla and colleagues created a line of mice into whose DNA they added the RdRP-producing gene from Theiler’s murine encephalomyelitis virus (TMEV). The mice cells all produced viral RdRP – but the RdRP, rather than being confined to a replication factory as an actual virus would do, was free-floating. The double-stranded RNA (dsRNA) it produced out in the cell’s open seas triggered a dramatic innate immune system response (involving a dsRNA “sensor” called MDA5, to be specific) that stoked 80 interferon-stimulated genes (ISGs) into action. That led to torrents of antiviral molecules being released. Because the RdRP was coded into the host cells, it was produced day in and day out. The innate immune system’s interferon bath never drained. When Poeschla’s team injected such mice with lethal doses of encephalomyocarditis virus (EMCV), they survived just fine. When the team created human white blood cells and human lung cells with viral RdRP swimming about their cytoplasm and then exposed the cells to HIV-1, the virus failed to replicate. With this NIDA grant, Poeschla and his team will move their work forward. One of Poeschla’s biggest questions is why these mice don’t seem to suffer any of the autoimmune problems one would otherwise expect. His sense is that, evolutionarily speaking, if this life-long MDA5-driven interferon extravaganza were something close to a panacea against pathogens without any downside, it would have long since evolved as a norm in mice and men. That is, there must be some cost, he said. The road ahead will be winding. Poeschla and his team hope to illuminate some of the inner workings of the innate immune system, how tolerable this sustained activation is over time, and whether viral RdRP can be harnessed to block viruses from establishing themselves in the body in the first place. They hope to learn how cells humming with incessant immune-response activity manage to not trigger autoimmune disorders, knowledge which could help in developing therapies for things like lupus, rheumatoid arthritis and type-1 diabetes. They wonder whether the approach might augment the potency of vaccines. They’re also now working with Laurel Lenz, PhD, a CU Professor of Immunology and Microbiology, on how these mice handle listeria and tularemia, which are bacterial rather than viral diseases. It’s an important step, Lenz said, in particular because prior research has shown that virally triggered interferon cascades can make bacterial infections worse, not better. Whether that’s the case with Poeschla’s mice is a big question. Perhaps Lenz will quickly confirm that viral immunity comes at the steep price of bacterial susceptibility, which would help explain why we keep our interferon in check. Or perhaps will one day we’ll all take a daily vitamin-like RdRP pill that confers broad-spectrum immunity against all sorts of invisible invaders. Either way, Poeschla says, his team – and more broadly, medical science in general – will know more than they did before they started, and we’ll be better for it.